In 1936 Hamilton introduced the Watson. It's easily mistaken for an earlier watch called the Webster, but the Watson has a smooth sided case while the Webster has slight steps to the sides. The Watson was produced through 1939. 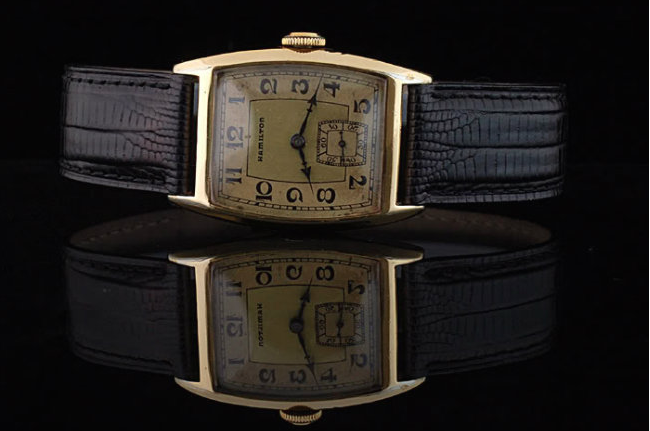 Another difference between the Watson and Webster is the Watson came only with a 10K yellow gold filled case while the Webster had a 14K yellow or white case. 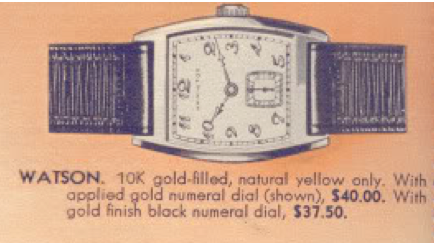 Two dial options were available for the Watson, an AGN dial or a two-tone gold and black numeral printed dial. The 10K gold filled case is prone to wear through to the edges of the bezel from the crystal corners down to the straps. The style of hands you'll find on the Watson are called "spear" hands. 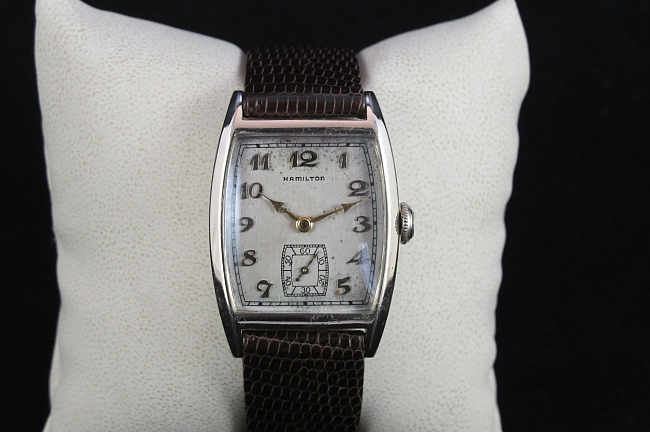 Since the Watson was made from 1936 to 1939, you're just as likely to find a 17 jewel 987E as a 17 jewel 987A movement under the dial. Here's a shot of a Watson I recently acquired and overhauled. It was listed by the seller as an "automatic"... go figure. It was a bit of a wreck and took me a long time to get running but it turned out really well. The original dial has some spots, but so will I when I reach 75 years old. 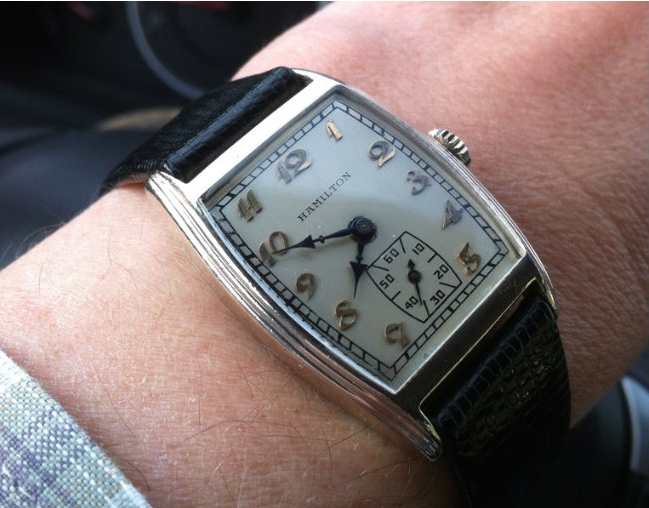 Here's a nice example of the black numeral dial courtesy of Tom Diss. And just for comparison's sake, here's a shot of a Webster (this one is in white gold filled). You can see the main difference is the shape of the side of the case and the seconds register is a little different too. Both watches use the same crystal. I have a Watson, and indeed, the bottom does have areas that are worn through. But it still ticks, occasionally!